The Lower Devonian plant Aglaophyton ( = Rhynia major), which is abundantly seen in the Rhynie chert (Fig.1), does not often show a distinct view of its epidermis. The rare cases where it does may look surprisingly different as a result of not yet explained peculiarities of fossilisation. Fig.1 (right): Aglaophyton sections in Rhynie chert, in various states of decay; one fragment seen in lateral view, with uncommonly well preserved epidermis pattern. See enlarged details. Width of the picture 20mm. Fig.2 (left): Aglaophyton epidermis with unevenly distributed stomata, detail of Fig.1. Width of the picture 8mm. 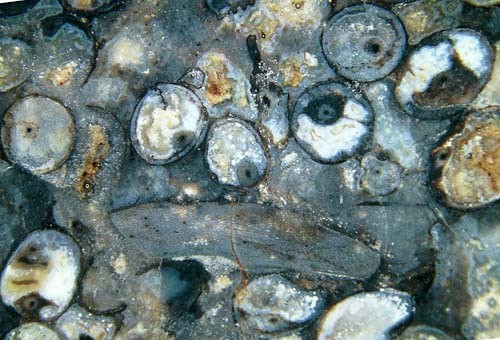 Fig.3 (below left): Aglaophyton epidermis, detail of Fig.1, width of the picture 3mm. 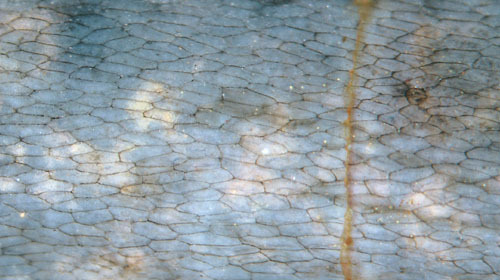 Fig.4 (at the bottom): Aglaophyton epidermis, detail of Fig.1, only one stoma seen here, width of the picture 2.3mm. The unexpectedly distinct surface pattern is apparently brought about by tiny grooves filled with cuticle substance between adjacent epidermis cells. The meshwork appears even more delicate in Fig.4. Cell edges beneath the surface are faintly seen through the transparent chalcedony on a few cells in Figs.3,4. A quite different and even more enigmatic aspect of the epidermis of Aglaophyton is shown in Rhynie Chert News 6, where there is a conspicuous polygonal black frame with fitting shape placed right below the upper face of every epidermis cell.